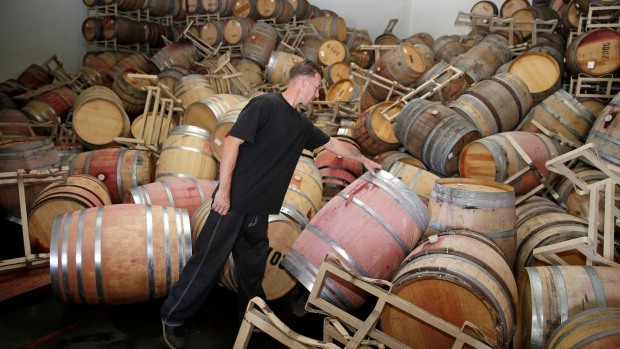 Eschol Winery, which dates from 1886, hit hard by quake. 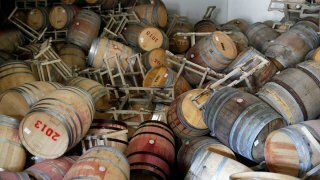 An historic wine country building at the Trefethen Family Winery was damaged in Sunday's earthquake. The historic Napa earthquake, the worst temblor in the Bay Area for 25 years, has also damaged an historic wine country building. At the Trefethen Family Vineyards, the Eschol Winery building -- which had survived both the 1906 earthquake and the Loma Prieta quake in 1989 -- has been badly damaged following Sunday's 6.0 shaker, according to the Santa Rosa Press Democrat. The large, three-story "grand wooden building" had housed the winery's visitor center and tasting room, and has a spot on the National Register of Historic Places. It's now leaning badly to one side and has been declared off-limits while structural engineers and others figure out what to do with it. John and Janet Trefethen, who own the winery and the building, say they want to fix the building if it can be fixed. The winery makes about 60,000 cases of wine a year, using grapes grown on the winery property, the newspaper reported. The building was put on the national register in 1988.